When a Maryland resident receives a conviction for drunk driving in another state the consequences to the Maryland license can be devastating. The driver can have his Maryland license suspended, revoked, canceled, or refused, and that is just the beginning. However, even where an administrative law judge (ALJ) takes pity on the poor driver and decides to allow work related and alcohol education/treatment related driving, the MVA may refuse to issue the restricted license awarded by the ALJ, where the driver is currently suspended in the foreign jurisdiction. Or the driver keeps the license but cannot renew when his license expires since he is currently suspended in another state. And therein lies the catch. Even though a Maryland driver can only lose the privilege to drive in another state, where the licensee might not have a need to drive, as the result of the action of the foreign jurisdiction, the Maryland MVA may insist on receiving clearance from the foreign jurisdiction before granting any driving privileges to the licensee here. As a result of a conflict within Maryland law, your client may be twisting in the wind before he or she can legally drive again, despite an order from an ALJ authorizing work related or other driving privileges here. First, let us quickly review some universally recognized licensing provisions. A Maryland license, issued by the Maryland Motor Vehicle Administration (MVA) authorizes an individual to drive a motor vehicle in Maryland, Maryland Code Ann., Transp. Art., § 16-101, and the other 49 states and the District of Columbia grant a privilege to drive pursuant to reciprocity. See, Transp. Art., § 12-404. The suspension of a Maryland license means a driver cannot drive anywhere. The suspension of the privilege to drive in another jurisdiction means the driver may not drive in the state where the privilege is suspended. See, e.g. Benbow v. State, 322 Md. 394, 587 A.2d 1110 (1991). When a Maryland licensee is charged with drunk driving, in many foreign jurisdictions, the privilege to drive is suspended in that state for some period of time. Under the Driver's License Compact, Transp. Art., § 16-701, et. seq., an out of state conviction for drunk driving is reported to the Maryland MVA and the driver is assessed points. The MVA then seeks to suspend or revoke the Maryland license under Transp. Art., § 16-206(a)(v) because he has "committed an offense in another state that, if committed in this State, would be grounds for suspension or revocation" and § 16-404 for a points violation. If the licensee shows at the hearing that they need the license to drive to and from work or in the course of employment the ALJ may modify the suspension or revocation and issue an order allowing the MVA to issue a license with a restriction allowing work related (or alcohol education/treatment related) driving only. Opinion 82-029, 72 Op. Atty. Gen. 357 (1987). What normally happens is the ALJ confiscates the old driver's license at the hearing. After the hearing, the driver takes the license restriction order issued by the ALJ to a counter at the MVA to receive a new license. This is where the trouble begins. The MVA may not issue a new license to anyone "during any period for which the individual's license to drive is revoked, suspended, refused, or canceled in this or any other state . . ." Transp. Art., § 16-103.1. Thus despite the fact that an ALJ determined that the licensee could drive with certain restrictions, if the individual received a suspension in the foreign jurisdiction, the 90 day work restricted license, for example, may not be issued until after the licensee receives clearance from the foreign jurisdiction. Sections 16-206 and 16-404, which allow work restricted permits to be imposed for convictions received in other states, conflict with § 16-103.1 which prohibit it. In this way, a 90 day work restricted license can become a one year suspension of the Maryland driver's license plus a ninety day restricted license. This situation can become quite desperate for the driver who faces the prospect of losing a job, despite a decision by an ALJ, after reviewing all of the relevant mitigating evidence, that it is not necessary to prohibit all driving to protect the public safety. Although the situation is dire, it is by no means hopeless. The solution is not exactly simple either. Within 30 days of the administrative hearing, the driver may file an appeal to the circuit court of the county where he resides. Transp. Art., § 12-209. Under § 12-209, the MVA may grant a 120 day stay of the pending sanction during the pendency of the appeal "unless it appears to the Administration that substantial and immediate harm could result to the licensee or others if the license or privilege is continued pending appeal." If the MVA refuses to grant a stay, the licensee can request a stay from the court. There should be some legal basis for filing the appeal. Once the appeal is filed, it will be necessary to explain the situation to the Assistant Attorney General handling the case. Frequently, if the Attorney General agrees that the appeal has merit, a consent order can be prepared for signature by a circuit court judge settling the case. In this case the order must provide either for return of the original license (if it has not been destroyed) or issuance of a new license, despite § 16-103.1. A similar problem occurs where the driver, not knowing of § 16-103.1, obtains an apparently valid license, either after a hearing, or after renewing the license before or within 6 months of expiration, see, Transp. Art., § 16-115. The MVA, unaware of the suspension occurring in the foreign state, issues the license. When the MVA discovers the foreign suspension it issues a cancellation notice under Transp. Art., § 16-201. The cancellation notice will indicate that the licensee must surrender the license on the cancellation date, which is usually 30 days after the date of the notice. If the licensee is unable to clear up the foreign suspension during that time, the cancellation takes effect. There is no offer of an administrative hearing, although one may always be requested. The MVA's Office of Administrative Adjudication handles these problems, and will often grant an extension of the cancellation date if requested. It is probably wise to request an extension, as well as an administrative hearing, so that if clearance in the foreign jurisdiction is not forthcoming, an attempt may be made for avoid the cancellation. If these measures are unsuccessful, the appeal and stay route mentioned above are options to be considered. With a lot a perseverance and a little legal skill, it is possible to keep your clients happy and on the road. 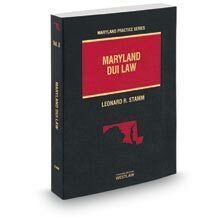 Ultimately, it will be the responsibility of the courts or the legislature to correct the conflicts in the Maryland Vehicle Law.